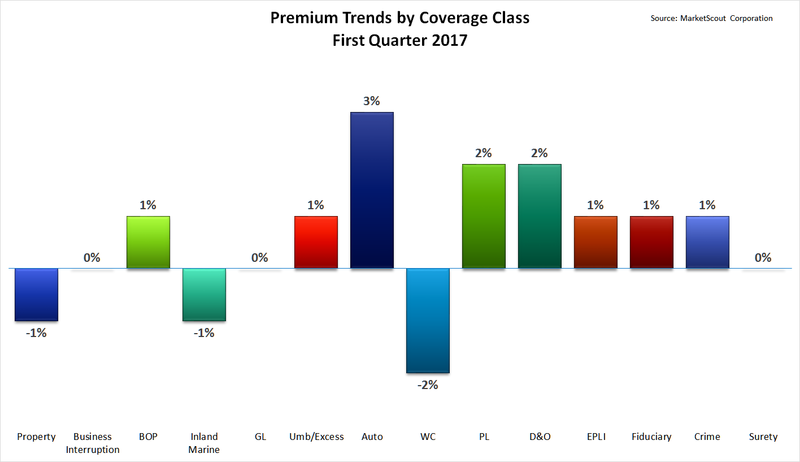 Insurers are moving away from the rate cuts of 2016, according to online insurance exchange MarketScout’s take on the first quarter 2017 rate environment. For the first time in 20 months, the composite rate index for commercial accounts in the United States measured a rate increase at plus 1 percent, MarketScout said. Rates for business interruption, inland marine, workers’ compensation, crime, and surety coverages held steady in the first quarter. Rates for all other coverages either moderated or increased. By industry class, every industry experienced a move toward higher rates in the first quarter. Transportation had the largest rate increase at plus 5 percent, MarketScout reported. Small accounts (up to $25,000) were assessed a 1 percent rate increase in the first quarter of 2017. Medium accounts ($25,001 – $250,000) were flat while both large ($250,001 – $1 million) and jumbo (over $1 million) accounts enjoyed rate decreases of minus 1 percent and minus 2 percent respectively. Check out Insurance Information Institute facts and statistics on the commercial lines insurance market here.